Welcome to another installment of this column. Today, we highlight Al Caruso Insurance Agency, a Colusa Circle business that has called Kensington its home for a quarter century. STROLLING ALONG COLUSA CIRCLE, you may just happen to miss the Al Caruso Insurance Agency. Its location is not easy to miss"the only four-story business building in Kensington"but Caruso's office is being renovated and there's nothing, short of the address on the front, that would indicate that this was his firm. Affiliated with the Farmers Insurance Group of Companies, Caruso has been selling insurance from his 367 Colusa Avenue location for most of his career. When completed, the current renovations will provide comfortable accommodations for eight agents where only four were situated before. The building is owned by Caruso and his two sisters. The Caruso family moved to Kensington in 1955 and one of his sisters still lives in the family's original Ardmore Road home. Kensington's "laid-back attitude" appeals to Caruso. "It's 'very nobody-knows-where-it-is'" Caruso says, and he enjoys the degree of privacy that the anonymity provides. 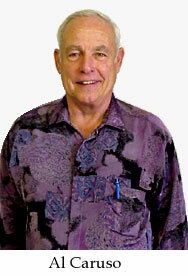 Caruso is generous with his time and capital through his memberships and service in the Albany Lion's and Rotary Clubs. Both organizations help those in need locally and internationally. He is also on the board of directors of the Adobe Halfway House in Benicia, and is a member of both the Albany and El Cerrito Chambers of Commerce. The insurance business has been around for centuries, but it must change constantly to adapt to current events and technology. Caruso realizes that a lot of people are now shopping for insurance over the Internet. He says his agency will " match or beat any Internet prices." "There is a fallacy that you can get term life insurance cheaper over the Internet, but it is exactly the same price with each company as it is with me. And what you get with me is personal service." Does he have any advice for insurance buyers? "Don't turn in a claim that is just a few hundred dollars more than your deductible," Caruso recommends. "Set a higher deductible and use your insurance only for catastrophic situations." Caruso realizes that insurance salespeople are often stereotyped in unflattering ways. He's convinced that most insurance agents are "very dedicated people" who aim to "provide the best possible service" to their clients. He offers personalized service to his customers. "One of my guiding principles is 'See the people'." 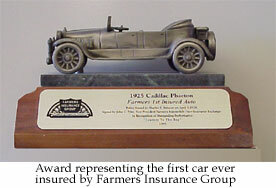 Al Caruso Insurance Agency can be found on the Web at www.farmers.com.